NASHVILLE, Tenn. (January 27, 2014) - Central South Distribution (CSD) artists and label partners came out on top at the 29th Stellar Gospel Music Awards winning honors in numerous categories. Tamela Mann was the leading lady of the event, taking home the award for each of the seven categories in which she was nominated, including the night's biggest award, Artist of the Year. With seven statues in hand, Tamela set the record for the most wins by a female artist at the Stellar Awards. John P. Kee was honored with two awards, including Traditional Male Vocalist of the Year. Lecrae nabbed the Rap/Hip Hop Gospel CD of the Year and Patrick Dopson won Recorded Music Packaging of the Year for Mann's album, Best Days. "Central South Distribution is honored that four of our amazing and talented artists, Tamela Mann, John P. Kee, Lecrae, and Patrick Dopson were honored at this year's Stellar Awards," said Chuck Adams, president at Central South Distribution. "Congratulations to all of our winners, and may God continue to bless each and every one throughout this coming year as they continue to share their gift of spreading His word through music." CD of the Year - "Best Days"
Traditional CD of the Year - "Best Days"
Urban/Inspirational Single or Performance of the Year - "Take Me to the King"
Praise and Worhip CD of the Year - "Best Days"
Rap Hip Hop Gospel CD of the Year - "Gravity"
Recorded Music Packaging of the Year - "Best Days"
The29th Annual Stellar Gospel Music Awards, hosted by Sherri Shepherd and Rickey Smiley, took place in Nashville, Tenn., on January 17, 2014, honoring the biggest names in Gospel music. National syndication of the show is scheduled January 18 to March 2. For a complete list of winners at the show, and for a complete list of airdates in each market, visit TheStellarAwards.com. Central South Distribution, Inc.'s mission is to nurture and cultivate God's message through the growth of Christian music. CSD has been servicing the Gospel and Christian community for nearly four decades and takes pride in being the #1 Independent Gospel Distributor, and the World's Largest Distributor of Gospel Music. They distribute Gospel Music to all of the top Gospel, CBA and Mainstream Accounts including, other distributors, chain stores and independent retailers. 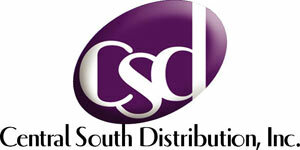 For more information, visit www.centralsouthdistribution.com.